I do silly things, such as deciding to walk from Greenpoint to the Upper East Side in flip flops. 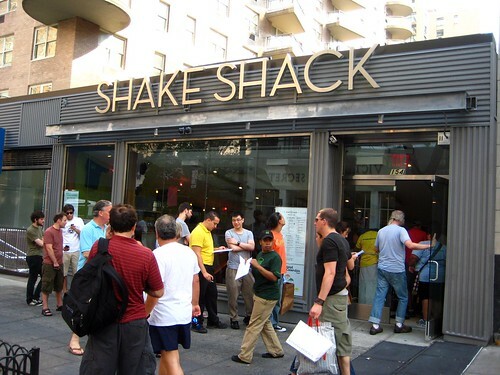 I wanted to get the Chocolate Peanut Butter Crunchcrete from the latest Shake Shack, and didn't feel like getting on the subway. Visions of peanut butter sauce, chocolate toffee, and chocolate sprinkles blended into chocolate custard danced in my little head as I walked the five miles between me and deliciousness. Only to not get it when I got there. Side-tracked! The Upper East Side Shack may now be my most favorite-until I visit the one in Saratoga Springs because that one involves betting on the ponies. There's an outside. There's an inside. There's ample seating. What's not to love? After my half hour wait on line, I got to the register only to see the dangerous words "Concrete Special." Remember: there are no set dates for the specials. All must be had at once! 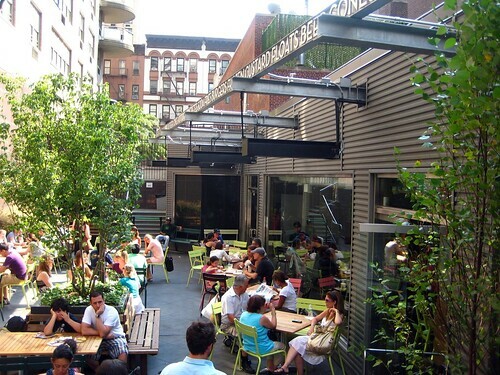 The current special, MillionsTreesNYC, most likely, one can assume, has some proceeds benefiting MillionTreesNYC, which probably needs help raising funds since it costs $2500 to plant a $70 cherry tree! But I'd love to see more trees in New York and if eating chocolate custard can help the cause, I'll gladly fork over my $6.75. The special consists of local New York State honey and graham crackers blended into chocolate custard. The big chunks of cracker and tinges of honey created a nice combination with the chocolate though I would have liked another add-in to really make it worth it, maybe banana. It was good, just not my favorite of all time. 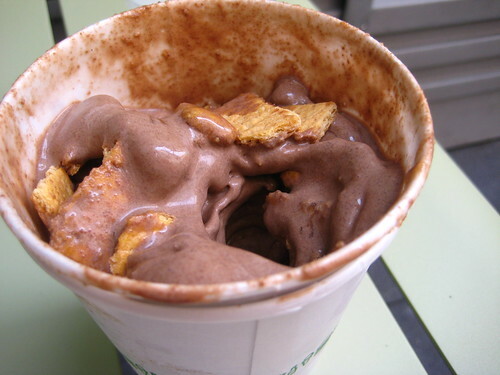 I'm still thinking about the Chocolate Peanut Butter Crunchcrete though. I usually get swayed by the specials too. Disappointing when they don't come through.